Paddy is one of the most famous Irish whiskeys, available in a new format with this 35cl bottle. 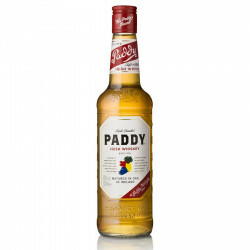 Paddy is a blend with a high percentage of triple-distilled Pure pot still whiskey. Paddy is quite famous in Ireland and France, where it is the second best selling Irish whiskey. This blend is a combination of 7 year old whiskies aged in oak casks, where they gained the mellow, vanilla and golden colour that are Paddy's signature. Nose: a complex and pleasant blend of citrus aromas (lemon, grapefruit) and spices, mingled with honeyed vanilla and woody and pleasantly malted notes, for a light, fresh and smooth overall. Palate: round, mellow but rich, developing onto malted, roasted grain and spice notes, with a hint of vanilla and honey. Finish: bittersweet, slowly vanishing and opening on slightly round malted and woody notes for a lingering pleasure. You may enjoy Paddy neat or on the rocks to develop the aromas. This whiskey is a good base for cocktails and the iconic Irish Coffee.